Dimension: 48 inches in height, 33 inches in width, and 25 inches in depth. 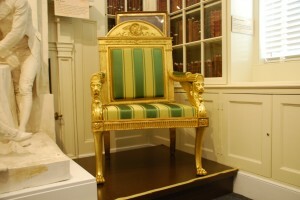 Description: A French empire-style mahogany chair with a straight, squared back topped with an arched brass crest. This hand-carved crest depicts an eagle with its wings spread, holding a laurel wreath and a scrolling ribbon in its talons. The top of the crest rail is carved wheat with floral and oak decorations. Corinthian fluted columns inspired the chair legs. The two front legs have claw feet while the back are raked and tapered. 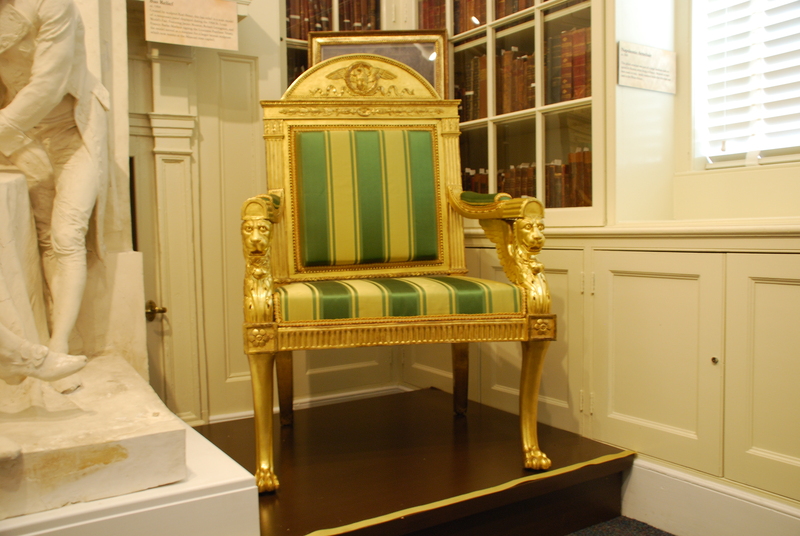 Decorative beading surrounds the chair cushions, which have been restored with gold and green striped silk fabric. 3-D Scanning Process: The Kinect scanner was used to scan this object. Because this object was slightly reflective and there was limited space to scan, we had to take several scans of the White House Chair. Unfortunately, we do not have the experience or technology to mesh them together, but the partial scans we do have still provide a sense of the object’s detail. For the complete collection of scans of the White House Chair, click here.